We are excited to announce that Southwestern Advantage was the large-company recipient of the 2015 Torch Award for Ethical Commerce by the Better Business Bureau of Middle Tennessee. 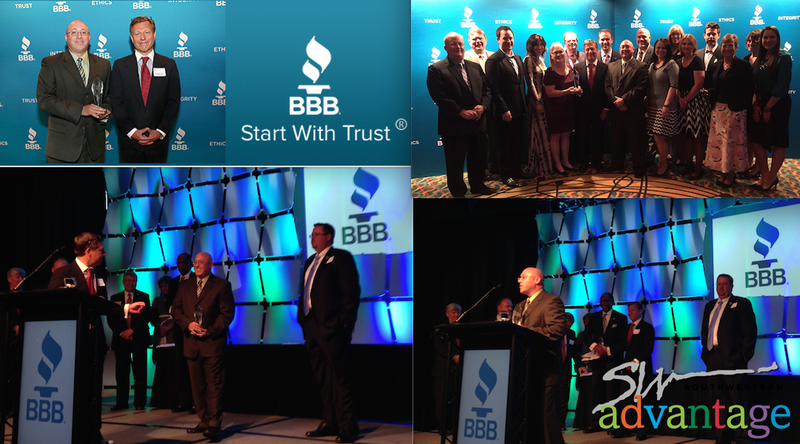 "Annually since 1998, BBB presents Torch Awards for Ethical Commerce to companies in Middle TN who exemplify BBB’s mission of ethical business practices. The BBB Torch Awards program is a rigorous process for any company participating in the entry process, says, Kathleen Calligan, BBB CEO. "This is no popularity contest as nominees are reviewed by a panel of independent judges who evaluate the company’s demonstrated commitment to business practices that build trust with employees, customers, and vendors and in the marketplace."" Pictured: Representatives from the Southwestern Family of Companies, including Southwestern Advantage, Southwestern Consulting, ThinkingAhead, and Great American.